A-HOTEL.com - Luxury and cheap accommodation in Verkhneye Rybolovo, Russia. 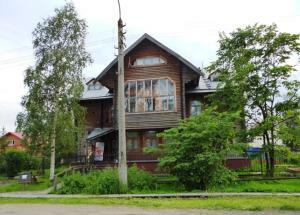 Prices and hotel, apartment booking in Verkhneye Rybolovo and surrounding. Situated in Arkhangelsk, within 2.4 km of Trud Stadium, Country House on Valyavkina 33 is an accommodation offering river views. Located in Arkhangelsk, just 500 metres from Trud Stadium, Apartment on Suvorova 11 offers accommodation with free WiFi. This apartment provides a shared lounge. Мотель на Карельской offers accommodation with a bar and free WiFi. Some units also have a kitchenette equipped with a microwave. Located in Arkhangelsk, 1.6 km from Trud Stadium, Vologodskaya 30 provides a living room with a flat-screen TV. Offering lockers, Kak Doma Hostel is located in Arkhangelsk, a 7-minute walk from Lomonosova Park. The bank of Kuznechikha River is a 10-minute walk away. Set 2.7 km from Trud Stadium in Arkhangelsk, Elena'a Apartment offers accommodation with a kitchen.